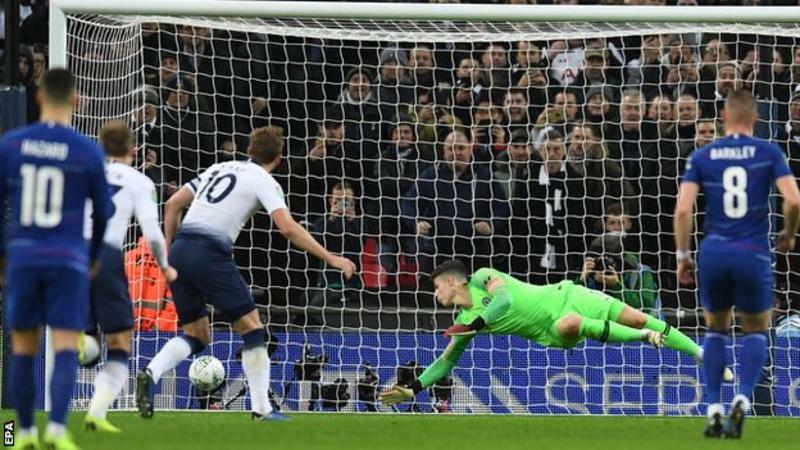 Harry Kane’s first-half penalty gave Tottenham a slender advantage after the Carabao Cup semi-final first leg at Wembley. Referee Michael Oliver awarded the 26th minute spot-kick after consulting VAR for offside and Chelsea keeper Kepa Arrizabalaga’s foul on Kane. Spurs and Chelsea both had chances in a fiercely fought contest and Blues’ manager Maurizio Sarri will feel this tie is still very much alive before the second leg at Stamford Bridge on Thursday, 24 January. Chelsea hit the woodwork twice in the first half through N’Golo Kante’s near-post flick, and when Spurs keeper Paulo Gazzaniga athletically turned Callum Hudson-Odoi’s deflected cross onto the post. Andreas Christensen missed a glaring opportunity from six yards after the break while Arrizabalaga also produced a fine save from Kane as this semi-final remains in the balance. This was not Spurs at their fluent, intense best but they showed character and resilience to dig out what may prove to be a decisive advantage as they seek to reach the final for the first time since they were beaten by Chelsea in 2015. Manager Mauricio Pochettino has made no secret of the fact he does not place this competition high on his list of priorities and would not even regard success in it as a compelling measure of his team’s progress – he reserves that status for the Premier League and Champions League. There is still currency in winning a trophy, however, and success here would go some way towards bolstering Pochettino’s reputation as he remains without silverware, for all his good work, and also answer questions about a team that has recently stumbled at the crucial moment. Kane was the match-winner again as Spurs’ chances were limited but they held out at the back as Chelsea increased the tempo after the break, although Sarri’s side were also left cursing the woodwork on two occasions.